There is no such thing as a free car rental. 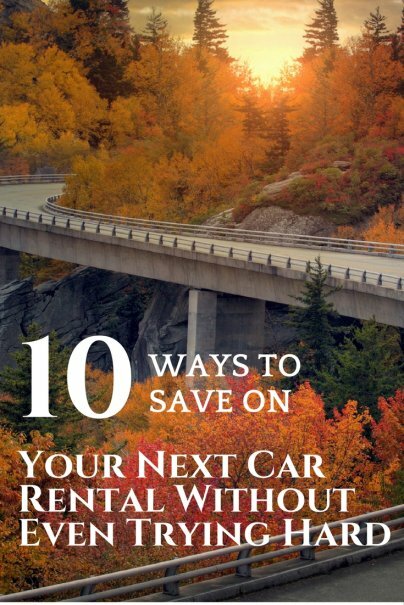 But with these simple tricks, you can snag a car rental for less. Big-name car rental companies, such as Hertz and Enterprise, may have earned your trust over the years. But like most things we buy, certain names come with a bigger price tag. It doesn't matter the company that issues your rental, as long as the car is safe and suitable for your family. Skip the big name car rental companies and go with a smaller company. To illustrate, a recent online search for a midsize car rental showed an average daily rate between $55 and $61 from major car rental companies, such as Avis, Enterprise, and Hertz. However, car renters who booked through Fox Rent a Car were able to snag the same sized vehicles for just $12 a day. Rates were before taxes, insurance, and other fees. You can search codes online for a particular rental company, or call up your credit card company or AAA and ask about eligible codes. And the best part is that some rental car companies let you combine a discount code with a promo code for additional savings. It's certainly convenient to book your car rental through the airport if you're flying into your destination. However, there is a price for convenience. To save money on your car rental, book your rental through an off-airport location, and then take a shuttle or taxi there. Returning a rental car to a different location may seem like a minor move. But to the rental company, it's a huge deal, as they'll have to drive the car back to its original location — which translates into extra fees for you. A midsize car or an SUV may be spacious, but do you really need it? If you don't need the extra space, you're simply paying more for nothing. Booking your car rental online or over the telephone prior to your trip locks in your rate. Unknown to some people, car rentals are usually cheaper when the company has a lot of cars in stock. For this reason, you should not wait until the last minute to book your reservation. By waiting until the last minute, there's a chance that the rental company will have a limited stock, and since there's a greater demand for vehicles, this will drive up your rate. When booking a car rental, the company will ask for a credit card number to hold your reservation, but they won't charge your card at this time. However, if you agree to prepay for your car rental, you can save as much as 20%. Unfortunately, if you were to cancel your reservation, the car rental company may charge a cancellation fee between $10 and $50. "The strategy takes advantage of lower prices aimed at leisure travelers who are more likely to travel on weekends," said Marty Paz, a telecommunications manager from Las Vegas. If you're planning a four or five-day trip, rather than book the trip for a Monday to Thursday, perhaps you can plan a Thursday to Sunday or a Friday to Monday trip. Make sure you understand the car rental agreement and what's expected of you before you drive off the rental lot. The car rental company will undoubtedly require that you refill the gas tank, and if you fail to put gas in the tank, they'll charge you a ridiculously inflated per gallon price. Additionally, there may be an extra charge to use the car's GPS or the satellite radio. Do you have another trick to help pay less for a car rental? Let me know in the comments below.